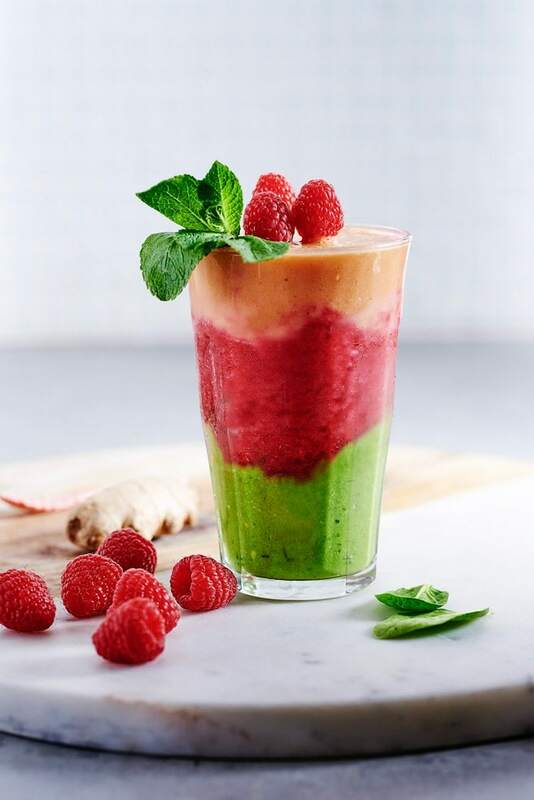 Boost your fruit and veggie intake with this Tutti Frutti & Veggie Smoothie – Loaded with fresh wholesome ingredients and naturally vegan, gluten-free and dairy free! I love breakfast smoothies, they’re the best and quickest way to kick start your day! Packed with all the energy and nutrients you need, smoothies are also perfect for busy mornings. When I’m in a super hurry, I just take it with me for a fuss-free breakfast on the go. Vibrant, colourful smoothies are my absolute favorites. I’ve tried a lot of different combinations over time and I find this Tutti Frutti & Veggie Smoothie to be a total winner. 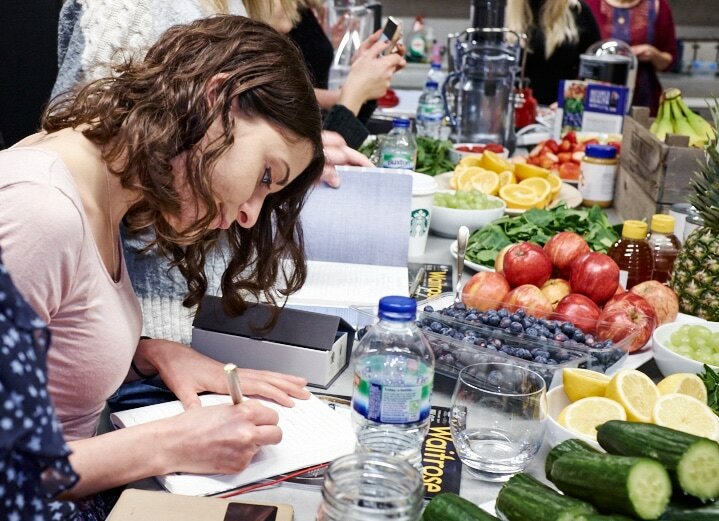 I came up with this smoothie recipe whilst attending a smoothie making session organized by John Lewis a few weeks ago. Together with a bunch of food blogger friends, we were invited for a Q&A with Madeleine Shaw, and a smoothie photoshoot with a talented photographer and food stylist. We had the opportunity to create our own smoothies & juices, inspired by an array of beautifully displayed fresh fruits, veggies and nuts. To make the most of all that goodness, I put together a smoothie that includes super simple fresh ingredients that I usually have in my kitchen. I promise, this Tutti Frutti & Veggie Smoothie is a seriously full-of-goodness smoothie, and even though it looks pretty fancy, doesn’t require more than 5 min to make. The green layer is super thick and creamy thanks to the avocado, whilst the spinach and mint leaves give a refreshing taste and a good dose of vitamins. On top of that, a bright creamy mix of frozen raspberries and fresh coconut water give you a sweet, fruity flavour and boost your antioxidant intake. To finish off the smoothie, I’ve also added a refreshing combo of carrot juice, orange juice and ginger. Loaded with vitamins and anti-inflammatory benefits, both carrot & ginger are an amazing addition to the drink. To make the blending task a lot easier, I recommend you use a powerful blender, that can easily liquefy ingredients such as carrots. I like to use my reliable Vitamix, which is also available at John Lewis. 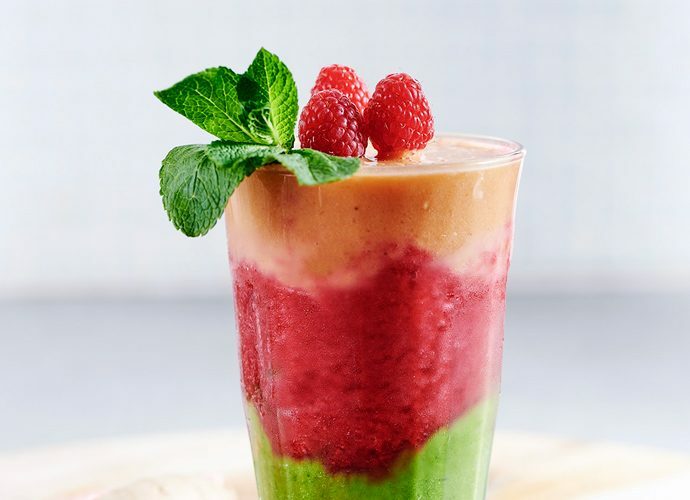 If you’re looking for a sweet, colorful smoothie for breakfast or post workout this is exactly what you need – This Tutti Frutti & Veggie Smoothie will keep you full, satisfied and energized all morning! Start with the green layer of the smoothie. In a powerful blender, (such as Vitamix) place avocado, spinach, mint and coconut water. Blend until smooth and pour into a glass. Rinse the blender, and fold in frozen raspberries and coconut water. Blend until frothy and pour over the green smoothie. Rinse the blender once again, and fold in carrot, ginger and orange juice. Blend until completely puréed, then fold in the banana and blend again until smooth. Pour over the other two smoothie layers and serve immediately. Enjoy! This post is sponsored by John Lewis. All writing, thoughts and opinions are as usual my own. I am such a child, totally drawn to this for all of the colours! Great way at helping me get more of my TEN a day!